Updated: 3:45 p.m. | Posted: 11:42 a.m. They call themselves a club — one they'd rather not belong to — with a laser-focused mission of keeping new members at bay. They're the parents, spouses, siblings, friends and other loved ones of people killed by drivers who were texting, talking on or otherwise distracted by their phones. And this year, they are on the verge of passing a new law that would place tight restrictions on phone use behind the wheel. "We are done. We have already lost our loved ones. We are not doing it for us. We are doing it for you," said Vijay Dixit, who is among the people applying pressure on Minnesota lawmakers to get a bill through. Dixit lost his daughter in a crash involving a distracted driver nearly 11 years ago. He said it's a no-brainer for the Legislature to pass the hands-free requirement, and said he and others who are grieving will continue to push for a vote. The bill that would require drivers who use cell phones to use only hands-free devices is headed to the House floor after it won approval in the House Ways and Means committee Thursday, but it is still stalled in the state Senate. 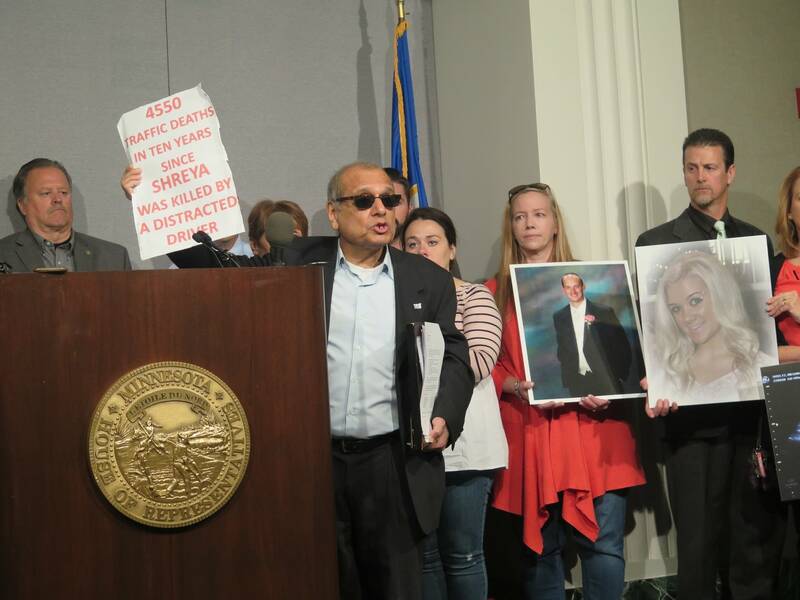 Family members of people who were killed by distracted drivers welcomed the committee vote and urged Republican Senate Majority Leader Paul Gazelka to allow the Senate to vote on the measure. Peggy Riggs' 20-year-old son David was killed in 2013 by a driver who was texting. She and her husband Craig told reporters that lawmakers need to take action this year. "I think one of the biggest things to remember here is that statistics have faces," Riggs said. "They're not just numbers. These are people's lives and our lives. The day my son died our life died with him." Texting while driving is already illegal, but supporters want to make it clear that any phone use by drivers must be hands-free. Earlier this week, Gazelka cast doubt on the chances of the bill passing this year. He said there are too many other big issues the Legislature still needs to grapple with, and there is not agreement that the hands-free requirement is the best way to stop distracted driving. When Gazelka said lawmakers have different ideas on how to address distracted driving, including more education, Dixit called it a "copout." "Wait for the education later. Do one thing at a time. You cannot boil the ocean in one step," he told Gazelka. "Do one step at a time and let's see. Only then we will know that you are really sincere." Danielle Wishard-Tudor is one of the club's newest members. Her brother, John-Claude, was killed in October by a teenaged driver she said was distracted by a phone. She said society and government must do more to separate driving and phone use. "When you mix a phone and you mix a car and someone driving it together, it's the most dangerous thing. It takes less than 30 seconds to kill someone," she said. "That's how long it took to kill my brother when someone was distracted." Rep. Mark Uglem, R-Champlin, is the chief sponsor but he often brings up that there are dozens of Republicans and DFLers as cosponsors. "I would be aghast if it did not come up on the floor for a vote," Uglem said. House leaders haven't committed to holding one. 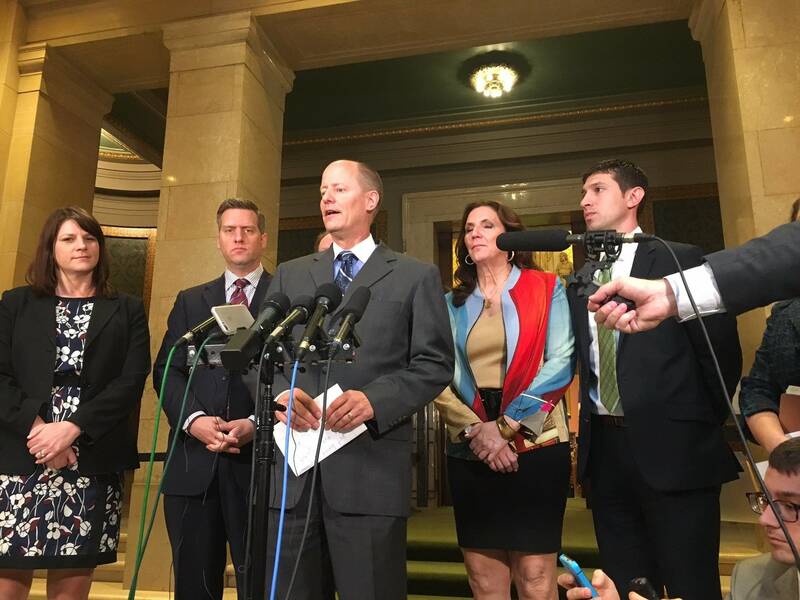 Presenting his bill to the House Ways and Means Committee, Uglem said it addresses the biggest public safety issue on Minnesota's roads today. The bill would add to an existing law against texting and driving by dictating that any phone use has to be done with voice-activated or hands-free capability except in emergencies. Repeat violators could be fined $225. "It's easy to comply with, but we're all going to have to learn some new ways of doing things. We all are," Uglem said, holding up his own phone. "We walk around the hallways looking at texts, bumping into people. And we're doing the same things on the roads." Sixteen other states now have laws like it. Col. Matt Langer of the State Patrol says a hands-free law would remove any ambiguity about what people do with their phones behind the wheel. The message would be clear: Don't touch them. He said troopers have seen it all. "Playing games on iPads, SnapChatting of course, Facebook, Facebook Live while they're driving," Langer said. "Driving by taking pictures of fatal crashes while they're driving. Imagine the irony there, it's just unbelievable." Langer said officers hear many excuses when they stop drivers suspected of texting while driving. "More often than not people don't necessarily want to confess to what they're doing," Langer said. As he left the Senate chamber, Gazelka spoke briefly with the family members who were hoping he would promise an up-or-down vote. He gave no assurances. Later, he told reporters that he understands the passion and appreciates the aim of the advocates. "Years ago I was negative and I've moved to neutral, so it's not like I'm trying to stop it," he said. Gazelka said if the House passes the hands-free bill, it would improve the odds of getting it done this year. "We'll see. You saw the passion of the people." But Gazelka said other senators think the approach is too narrow in pinpointing phones as the distracting driving cause. He's deferred some to fellow Republican Sen. Rich Draheim of Madison Lake, who said educating new drivers is part of the answer. He has a bill to include more instruction on distracted driving before licenses are issued. He also would bump up the penalties for texting and driving violations. "So you start getting a $175 or $300 or $350 penalty or fine, you're probably going to change your behavior," Draheim said. "So I think with the combination of education and increase in the penalty, I think it would help." Gov. Mark Dayton said he would sign a hands-free bill if it reaches him.